How much ink is there left in your HP 3650 cartridges? One of these weeks your HP 3650 will polish off its printer ink, and when it finally does happen you'll realise that new HP 3650 ink tends to be really expensive. However, you do not need to waste your time worrying about shelling out the steep prices you'll find on the main street because right here at Cartridge Save you can buy all the HP 3650 cartridges you'll ever want at really low prices. Save a lot of money on your ink by buying online at Cartridge Save! Why pay high prices for a 3650 original cartridge or 3650 compatible ink in the main street when you could save a ton of money ordering with Cartridge Save. Have utter peace of mind by ordering your DeskJet 3650 ink cartridges from us seeing as every one is underwritten by a hassle-free money back guarantee. Don't forget to take into consideration that each and every purchase also has free delivery, mostly arriving at your doorstep the next business day! The HP Deskjet 3650 caused a bit of a to-do when it was released and when you look at this printer in a little more detail, it soon becomes clear as to why this item was so readily celebrated! The HP Deskjet 3650 produces some very fine results and if you are seeking an affordable printer, but one which produces some pleasing print outs, then you might want to give the Deskjet 3650 a little bit of attention at the very least, as it deserves a lot of praise. In fairness, the HP Deskjet 3650 looks pretty much exactly how it should. Stylish shapes, an attractive yet subtle finish and a forward thinking attitude are all present in the HP Deskjet 3650. What's more, this very attractive piece of equipment is also adorned with a very easy to use interface, making it an all round winner in terms of design. 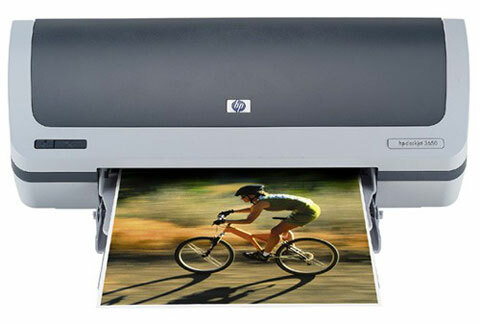 The Deskjet 3650 by HP passed many of our print quality tests with flying colours. Images were practically grain-free and photo quality was first-class. Another great feature of the Deskjet 3650 is its compact, space-saving design which includes a 100-sheet foldaway paper tray to keep your desk looking tidy. There are no major drawbacks to the HP Deskjet 3650 in truth. And, if you are only looking for a printer for your home and don't expect too much from it, you will actually be pleasantly surprised by what the HP Deskjet 3650 has to offer. A fine item indeed, and one which has completely earned the right to feature here amongst the best printers on the market right now; well done Hewlett-Packard.